Sleeps 8, 4 bedrooms, 4 bathrooms, hot tub, mountain views. 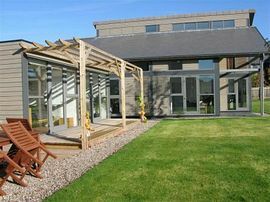 A luxury, stylish and eco-friendly home overlooking farmland in the beautiful village of Llangorse. 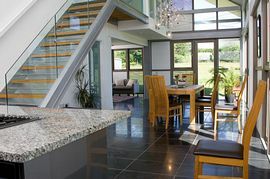 The focal part of the house is the large open plan kitchen and dining space open to the ceiling and with floor-to-ceiling windows overlooking the mountains, and floating oak stairs with stainless steel and glass banister. The oak table seats 8 comfortably and a door leads out to the decked terrace and garden. 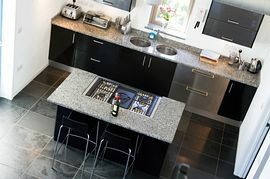 The kitchen is equipped with a black and chrome 5 ring range cooker with double oven set in an island with work space, and sleek units with granite surface provide ample storage space and are complemented by the double stainless steel sink and stylish chrome integral drawer fridge. 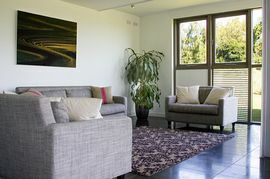 Off this room is a large relaxation area with sofas for 8 people and iPod Hi-Fi system. The spacious utility room has an American fridge/freezer with water fountain/ice maker, a dishwasher, microwave and washing machine. A second sitting room has a large L-shaped sofa , 42" wall mounted flat screen TV with 5.1 Surround Sound Home Cinema system. Large glass doors open out on the deck which has wonderful views of the nearby hills. A landscaped garden and decking surround the property, and a private enclosed area houses the large 8 person HOT TUB. Bedroom 1 - Twin bedroom. Separate bathroom with shower/wet room, toilet and handbasin. 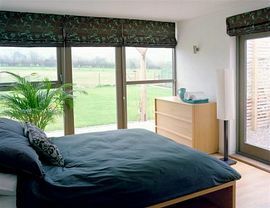 Bedroom 2 - Located on the western side of the building is a double bedroom with doors leading to the patio and to the hot tub. Separate bathroom, with turquoise mosaic tiles with bath, toilet and handbasin. Upstairs to 2 bedrooms. Bedroom 3- Master bedroom with large double modern four poster bed, built-in wardrobes. En suite shower room/wet room with large walk in shower, toilet and handbasin. Bedroom 4 - Twin bedroom with en suite bathroom, with comfortable deep bath with shower over, toilet and handbasin. Bedlinen and towels provided. Cot available. Ample parking. Landscaped gardens and lawns with outdoor table and chairs and a BBQ. Good mobile reception (except on O2). Wireless Internet. Built to modern building regulations with downstairs bedroom and wet room. Well behaved pets are welcome. Please be aware that the property is located on a farm. Located in the village of Llangors, 6 miles from Brecon. Offpeak: from £600 per week. Shortbreaks: from £400 per week. Open all year round. Changeover day is typically Friday, but there is scope for flexibility. Short stays to multi-week stays welcome.